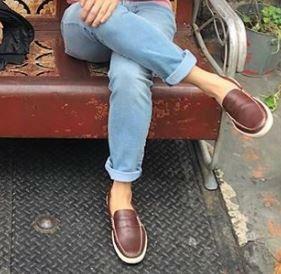 Penny loafer in hand-stained leather. Vulcanized rubber cupsole with nubby driving sole. I bought these for my husband and they fit really good. This is a very comfortable shoe. Looking forward to my next purchase. Love the feel and comfort of these shoes that I just ordered another pair in a different color. It is an amazing shoe! Love it! Keep 100! Versatile slip on that can be dressed up or down. Terrific color, & fits true to size; solid but comfortable outsole. A good shoe. I thought from the photo that the shoe was a lot more full. Kind of thin but it will work. Have to wear the shoe for a different look than intended, but still a good shoe. Comfortable and stylish. When purchasing slip on shoes I get a half size smaller. This is by far the best loafer that I've owned. It's comfortable and versatile to wear. I'm loving this for summer 2018! Great fit. High quality! On time delivery! Only Cole Haan can come thru with perfect customer service to match the company. I have and will always be a advocate. Great shoe. Super comfortable and easy style !! Great Price, Great Quality Shoe. Comfortable and can be worn with shorts, jeans or chinos. Already own the blue pair. The were very inexpensive and look cool. I have had several pairs of Cole Haan's and could not pass these up. I like Cole Haan quality> I have a number of Cole Haan products and am very satisfied with them. My husband loves these shoes. He says they are the most comfortable and best looking shoes he's ever bought. Great traditional look and comfortable sole; high quality shoes from Cole Hahn. Hubby has worn and loved them for years. I chose this footwear because it looks sharp and suave like me. I have always had good luck with Cole Haan! There were close to a pair of comfortable CH shoes that my husband loved but he left them in Europe. I like the style and the sole of this shoe. Replacing a driver style I like. We have these in blue too - awesome shoefor my young adult son! Very Stylish and simple. Look super comfortable too. Is the shoe made of real leather? BEST ANSWER: Uppers are real leather. Lining is man made. Soles are obviously not leather. Comfortable shoe. Yes, it is real leather. Is the insole cowhide leather? BEST ANSWER: This style has a textile insole. Can i purchase replacement insoles? BEST ANSWER: We do not manufacture or sell replacement insoles. However, the good news in this case is this shoe has a standard insole - you can use any replacement lace usually found where foot care products are sold.